Hoarding is a behavior that is seen periodically in Alzheimer's and other dementias, such as frontotemporal dementia, where individuals gather and stockpile things. They might not be willing to part with useless papers, keeping them all piled around furniture. They also might stock up on food and store it continually until it's rotten, and then still be unwilling to dispose of it. Hoarding can sometimes go hand-in-hand with constant rummaging through belongings. The sorting through of familiar items can be reassuring, and this may encourage the collection of more belongings. When During Dementia Does Hoarding Occur, and Why? Hoarding tends to happen in the early and middle stages of Alzheimer's disease. 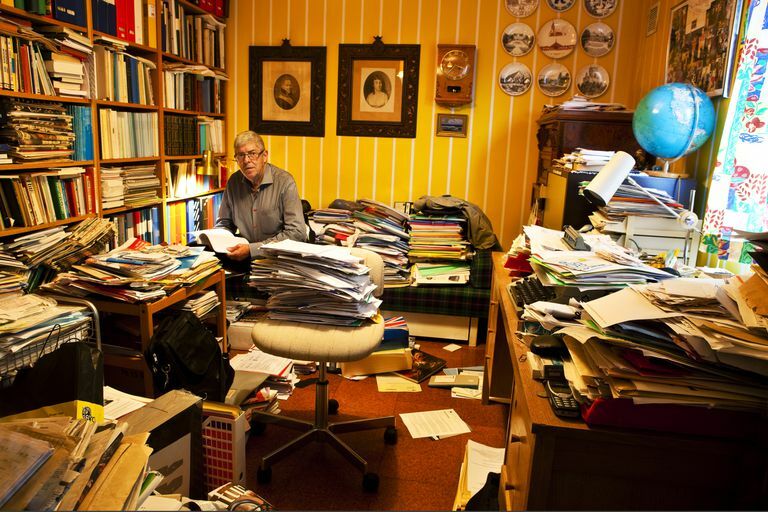 Hoarding can sometimes be a response to feeling isolated, in which the focus turns to things instead of interaction with others, or to the loss of control of memory functioning, friends or a meaningful role in life. You may be familiar with the popular television show Hoarders, but there is often a difference between those individuals and people with dementia. If you have dementia, you are likely hoarding things because of the anxiety of understanding that you might lose something. The presence of things around you might also provide you with a sense of comfort. People with Alzheimer's tend to hide the things they hoard, forget where they put them, and then accuse others of taking them. This sometimes goes along with delusions that someone is going to steal their belongings. Hoarding can also develop from a life-long tendency that becomes more out of control when dementia reduces impulse control. For example, the individual who collected bells or train sets for many years may begin to expand that collection. It soon may become a collection that takes over the house and now contains many items that have no value. What Items Are Frequently Hoarded? Why Is Hoarding a Concern for Someone With Dementia? There are multiple tripping hazards in the home because of piles of stuff. Food storage is attracting pests or is unsafe to eat. Lost things become a major source of distress for your loved one. Bills aren't getting paid because they're lost in piles of other papers. How Can You Help Someone With Alzheimer's or Another Dementia Who Hoards Things? Don't try to clean everything out of your loved one's home all at once. You're better off reorganizing it and clearing paths so that there is a less of a chance of her tripping over the clutter. Designate a drawer for belongings that are special to the person. It may be possible to remind them to place items there that they might otherwise lose. If you are removing things, such as rotten food, take it off the premises right away. If you leave it there and just throw it in the garbage can, your loved one might spend much time undoing what you did and taking it all back out. Rather than ask their permission to remove it, do it discreetly in order to not increase anxiety. Don't try to use lots of logic to persuade your loved one to change. This is rarely effective in someone who is living with dementia. Please be compassionate. Understand that the hoarding is a response to the dementia. It's her way of coping with changing memory and confusion, and it's not something she can easily control. Distinguish between harmful hoarding that poses a risk to the person and other hoarding that simply bothers you or embarrasses you. In dementia care, it's important to be flexible when at all possible, recognizing that dementia already takes much control from those living with it. Caring for a loved one with dementia is definitely challenging. Fortunately, there are resources that can help, including caregiver support groups. Specifically, the Alzheimer's Association provides information on where in your area support groups for dementia meet. Bakker, Rosemary. Weill Medical College of Cornell University Division of Geriatrics and Gerontology. Hoarding and Alzheimer's Disease; One Daughter's Story. Why Do People with Dementia Rummage through Drawers and Cupboards?